The nine-metre canoe is being carved by Ses Siyam (Ray Natraoro) of Squamish Nation and apprentice carver X̱ats’alanexw Siyam (Victor Harry). It is being shaped on CapU’s North Vancouver campus to commemorate the school’s 50th anniversary. 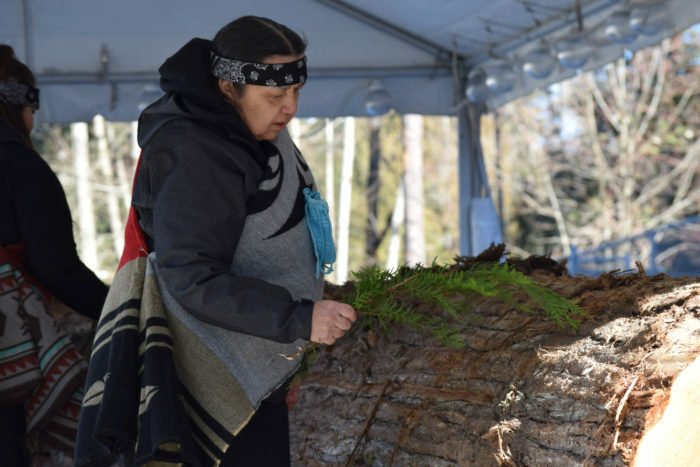 The cedar log being utilized is estimated to be 400 to 600 years old, and was prepared on Feb. 25 with an awakening ceremony. It was brushed with cedar by four women — Ann Whonnack, Charlene George, Dianne Natrall and Noelle Natraoro. Swowo Gabriel of Squamish Nation explained that the former tree saw many generations of people come and go, and had to be prepared for the next step in its life. “(The carvers) are going to be bringing this canoe into life as a new being,” Gabriel said. It will be the 34th canoe carved by Ses Siyam, who comes from seven generations of canoe carvers. “That was our family profession before [European] contact,” he said in a statement. Both Ses Siyam and X̱ats’alanexw Siyam are hereditary chiefs and have now carved eight canoes together. Ses Siyam said he hopes the process will be fairly interactive, as students and the public are being invited to stop by and observe the process as the traditional canoe takes shape. Students in the university’s Indigenous Independent Filmmaking Program are also filming a documentary about the carving process. “People can come by, take a look at it, help out,” he said. CapU Elder-in-Residence Ernie George of Tsleil-Waututh Nation has also been involved in conceptualizing the project, as he is a former canoe racer. “There are many canoe builders in our family tree too,” George said. CapU president Paul Dangerfield said he’s excited to see the canoe take shape on campus. “Ses Siyam is keen to share cultural teachings with the community as he carves,” he said in a statement. The canoe will be housed at CapU and taken out on the water during the summer. The carving has already begun in an open lot next to the Bosa Building. It is expected to be completed later this Spring. More information and updates can be found at capilaou.ca/50.